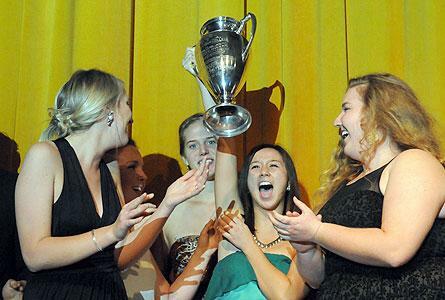 Hope's freshmen, the Class of 2017, won the 79th annual Nykerk Cup competition held Saturday night at the Holland Civic Center. The event, one of a variety of activities scheduled during the college’s Family Weekend, will feature more than 200 members of the freshman and sophomore classes competing in song, plays and oration. The participating classes this year are the freshman Class of ’17 and the sophomore Class of ’16, who are being coached by the junior Class of ’15 and the senior Class of ’14 respectively. The competition, first held on March 16, 1936, is named in honor of the originator of the program, John Nykerk, a professor, college dean and founder of the Hope College department of music. The event is continuously staged before a large audience and this year will be no different as the auditorium was sold out several days before the event. The sophomore orator is Rosemary Walsh of Evanston, Ill., whose coaches are Alyssa Drew of Portage and Jordan Ippolito of Ocean City, N.J. The freshman orator is Gabby Gazall of Naperville, Ill., whose coaches are Rachael Kabagabu of Okemos and Claire Tally of Overland Park, Kan. The sophomore play is “The Grinch.” The coaches are Ann Marie Paparelli of Grand Ledge and Erika Shima of Saline. The morale coaches are Daniel DeVinney of Grand Rapids, Dan Irvin of Macomb and Aiden de Jong of Holland. The freshman play is “Sparrow in Deo.” The coaches are Catherine Liang of Grand Rapids and Abby Wilhelm of Charlevoix. The morale coaches are Jake Buikema of Holland, Connor Brady of Walker and Drew Thomas of Holland. The freshman song is “You Can’t Hurry Love,” arranged by Mac Huff. The coaches are Marie Dollar of Lowell and Kasey Wierzbicki of Byron Center. The morale coaches are Jacob Verschueren of Twin Lake, Andrew Valdez of Wayne, Ill., and Nick North of Linden. The sophomore song is “Once Upon a Time,” arranged by Sara Wielenga of Lansing. The coaches are Sara Wielenga and Marcy Rudins of Glen Ellyn, Ill. The morale coaches are Nick Johnson of Whitehall, Alan Padilla of Rockford and Kian Hashemi-Rad of Edina, Minn.
During the event’s intermission, the song sections will perform “For Good,” music and lyrics by Stephen Schwartz and arranged by Mac Huff. The members of the Nykerk executive board this year are: Erin Drews of Elkhart, Ind., general chair; Christine Hunter of Grand Blanc, chair-elect; Sydney Timmer of Cochababa, Bolivia, senior secretary; Audrey Prins of Holland, junior secretary; Jamie Sloan of Wayland, senior publicity; Amanda Long of Zionsville, Ind., junior publicity; Kate Pitchford of Bloomington, Minn., senior production; Laurie Jellison of Richland, junior production; Rebecca Budde of Holland, senior treasurer; Anna DeGroot of Grand Rapids, junior treasurer; Meghan Stagl of Deerfield, Ill., senior spotlight; and Emilie O’Connor of Balsam Lake, Wis., junior spotlight. Family Weekend will feature a variety of other performances and presentations in addition to the Nykerk Cup competition. The De Pree Art Center is featuring its annual fall juried exhibition of student artwork from Friday, Nov. 1, through Sunday, Dec. 8. The exhibition will open on Friday, Nov. 1, with a curator’s talk at 4 p.m., followed by a reception in the gallery from 5 p.m. to 7 p.m. After the opening date, the gallery will be open Mondays through Saturdays from 10 a.m. to 5 p.m. and Sundays from 1 p.m. to 5 p.m. Admission to the talk, reception and exhibition is free. Hope College musicians will perform through the monthly “Brown Bag Concert” series at the Holland Area Arts Council on Friday, Nov. 1, at noon. Admission is free. The college’s biology seminar series will feature the address “Discovery and Development of Startect (a Combination Product for Gastrointestinal Parasites)” by Dr. David Thomson of Zoetis Inc. on Friday, Nov. 1, at 3 p.m. in room 1019 of the A. Paul Schaap Science Center. Admission is free. The department of engineering and department of economics, management and accounting will feature an address by Jon Veldman, executive vice president of global lean operations for Algeco Scotsman, on Friday, Nov. 1, at 3 p.m. in Winants Auditorium of Graves Hall. Veldman is a 1982 “4+1” graduate from hope and the University of Michigan, majoring in physics and mathematics and minoring in business, and holds an MBA from Ashland University. Admission is free. The college’s chemistry seminar series will feature the address “I’m Finally Beginning to Understand Why I Didn’t Understand…” by Dr. George M. Bodner, who is the Arthur Kelly Distinguished Professor-Chemical Education at Purdue University, on Friday, Nov. 1, at 4 p.m. in room 1000 of the A. Paul Schaap Science Center. Admission is free. The college’s volleyball team will host Albion College on Friday, Nov. 1, at 6:30 p.m. at the DeVos Fieldhouse. Tickets are $5 for adults, $3 for ages six through 17 and free for ages five and under, and are available at the ticket offices in the main lobby of the DeVos Fieldhouse and the Events and Conferences Office located downtown in the Anderson-Werkman Financial Center. They will also be available at the door. A concert featuring outstanding first-year recipients of merit-based music scholarships will take place on Friday, Nov. 1, at 7:30 p.m. in Dimnent Memorial Chapel. Admission is free. The H2 Dance Company, an affiliate of the college’s department of dance, will be presenting its premiere concert on Friday-Saturday, Oct. 25-26, and Friday and Saturday, Nov. 1-2, at 8 p.m. at the Knickerbocker Theatre in downtown Holland. Tickets are $10 for regular admission, $7 for senior citizens, and $5 for Hope College students and children 18 and under, and are available at the ticket offices in the main lobby of the DeVos Fieldhouse and the Events and Conferences Office located downtown in the Anderson-Werkman Financial Center. They will also be available at the door. The college’s swimming and diving team will host Olivet College on Saturday, Nov. 2, at the Dow Center. Admission is free. The college’s club hockey team will host Calvin College on Saturday, Nov. 2, at 9 p.m. at the Edge Ice Arena. Tickets are $5 and are available at the ticket offices in the main lobby of the DeVos Fieldhouse and the Events and Conferences Office located downtown in the Anderson-Werkman Financial Center. They will also be available at the door. The three-day Family Weekend, running Friday-Sunday, Nov. 1-3, will also feature activities geared toward parents of current students specifically, including a variety of open classes and tours. The Anderson-Werkman Financial Center is located at 100 E. Eighth St., between College and Columbia avenues. The De Pree Art Center is located at 160 E. 12th St., on Columbia Avenue at 12th Street. Dimnent Memorial Chapel is located at 277 College Ave., on College Avenue at 12th Street. The DeVos Fieldhouse is located at 222 Fairbanks Ave., between Ninth and 11th streets. The Dow Center is located at 168 E. 13th St., on 13th Street at Columbia Avenue. The Edge Ice Arena is located at 4444 Holland Ave. Graves Hall is located at 263 College Ave., between 10th and 12th streets. The Holland Area Arts Council is located west of Columbia Avenue at 150 E. Eighth St. The Holland Civic Center is located at 150 W. Eighth St., on Eighth St. west of Pine Avenue. The Knickerbocker Theatre is located at 86 E. Eighth St. The A. Paul Schaap Science Center is located at 35 E. 12th St., at 12th Street and College Avenue. Hope senior Courtney Earles has been chosen the Sports Imports/American Volleyball Coaches Association (AVCA) NCAA Division III Player of the Week. Derek Webb will perform through the Hope College Concert Series on Thursday, Oct. 24, at 8 p.m. at the Park Theater.